Glenn Greenwald personally inserted himself into this race by interviewing Crowley’s challenger, elevating Ocasio-Cortez’s profile for many in the nation’s leftist political circles. The apparent strain began to take its toll on Crowley, leading to a brief collapse during an outdoor event in Washington. Then, on June 15, the Queens Party Boss finally had his big televised debate. Opening remarks by both candidates set the stage for what would turn out to be a thorough takedown of someone once considered untouchable by so many. During the NY1 debate, Crowley revealed how culturally incompetent he was by continuing to defend the Immigration and Customs Enforcement service (ICE) when Ocaso-Cortez called to abolish ICE. 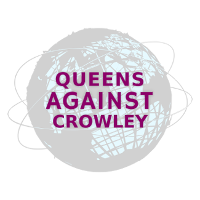 Although Ocasio-Cortez raised the issue of Crowley’s on-going support for ICE, an issue was not made of Crowley’s vote to establish ICE. In the midst of it all, a Twitter storm was raging. Many were quick to point out Crowley’s hypocritical and failed “protest” of ICE, while, at the same time, defending ICE during the televised NY1 debate — in which Ocasio-Cortez called for the Agency’s abolition. Queens Against Crowley has been tweeting this article. Others have been battering Crowley with the #AbolishICE hashtag. A deluge of media articles, commentary, and endorsements came forward after the NY1 debate, starting with a critical review of the debate by the Intercept and continuing with a surprise endorsement by Moveon.org. The Intercept reminded the public that Crowley’s brother, a lobbyist, had been enriching himself, by amongst other means, from rent payments being made from Crowley’s committee to reëlect. Others, too, have been feeding at the trough of the Queens machine. The Intercept further revealed that a GOP lobbying firm was hosting a fundraiser for Crowley in D.C., in contravention of Crowley’s efforts to market himself as a Democratic firebrand, who stands up to Trump and the Republicans in Washington. The Young Turks broadcast an interview with Ocasio-Cortez. Democracy Now featured a headline on Tuesday about the Crowley-Ocasio-Cortez race, the Nation magazine moved an article about women of color challenging powerful White male incumbents, and the Editorial Board of the New York Times shamed Crowley’s absence from two debates. 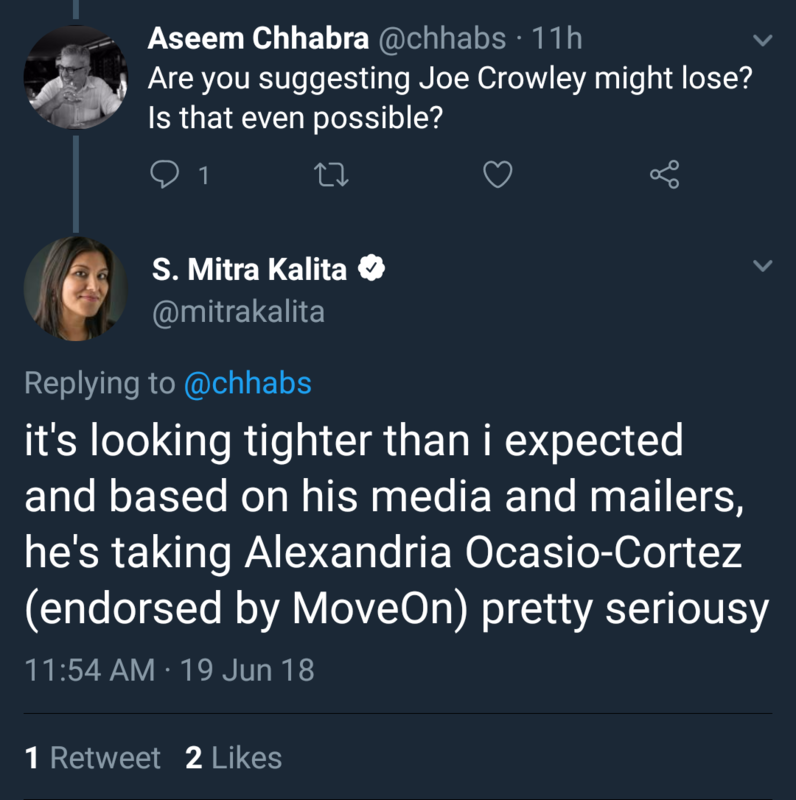 Amidst all this, S. Mitra Kalita, a CNN programming executive, began to raise questions about Crowley’s perceived inevitability of winning reëlection for a tenth term, noting the seriousness with which Crowley was responding to Ocasio-Cortez. 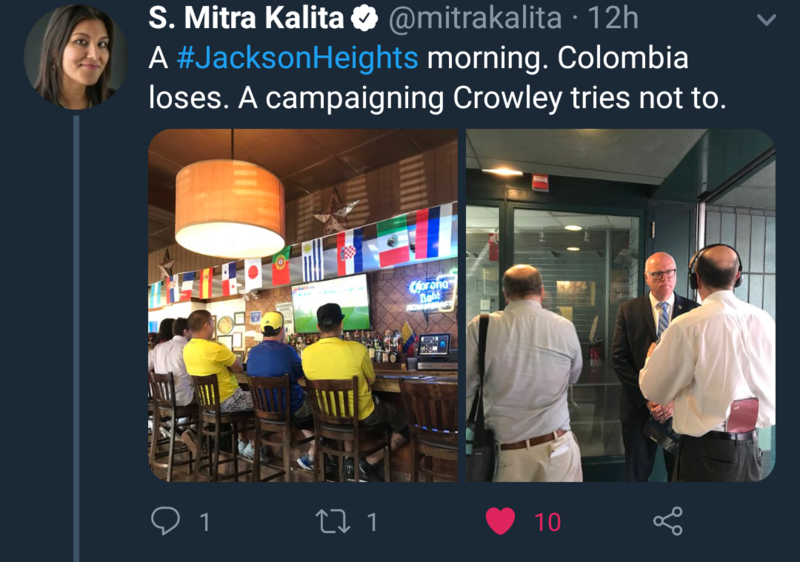 Crowley, having never actually faced a primary challenge all the way to the ballot box, clearly is not an experienced campaigner. As heavier scrutiny falls on his past activities and as primary election day approaches, we are starting to see aspects of his campaign become undone. 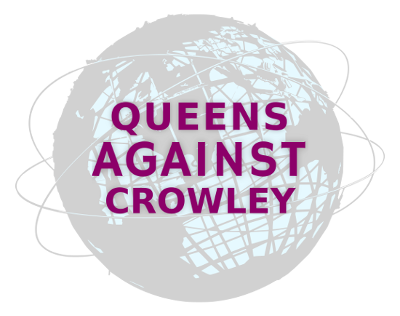 Despite long-standing suspicion of corruption and increased criticism, it is highly likely that Crowley is going to attempt to circle his wagons and ride out the storm as he seeks to expand the reach of his power. In the face of this, the main question we have to ask ourselves, as those making the waves, is will we be content to simply rock the boat, or will we help enfranchise the very voters that Crowley takes for granted.